A formal definition of fraction is the following : A number that can be represented by an ordered pair of whole numbers a / b , where b is not equal to zero. 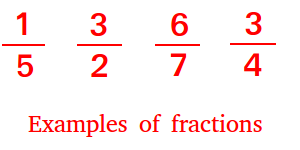 For example, the following numbers are fractions. A common misconception is to define fractions only as a part-to-whole model. It is true that initially, fractions were used to indicate the number of parts of a whole to be considered. 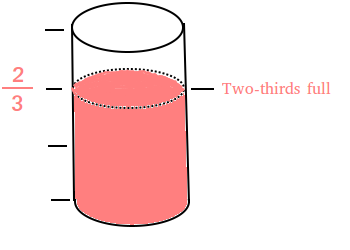 In the figure below, only two parts of the whole glass contain liquid. 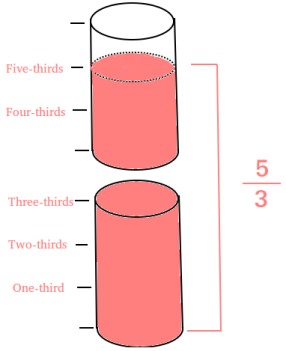 Since the glass is divided into 3 equal parts and only 2 parts contain liquid, we use the fraction 2/3 to represent the 2 out of 3 equal parts. However, as long as b is not zero, the definition of fraction allows us to choose any values for a and b. Therefore, a could be 5 while b could 3 and the fraction will be 5/3. Notice that the 4/0 is not technically a fraction because division by zero has no answer. And that is the reason the definition above says that b cannot be 0.